The campsite at Hollins farm proved an excellent choice with brand new emaculate showers and toilets and nicely situated between two pubs. Saturday saw us heading up the valley for the bridle path by Jubilee bridge just before the start of the climb up Hardknott pass. 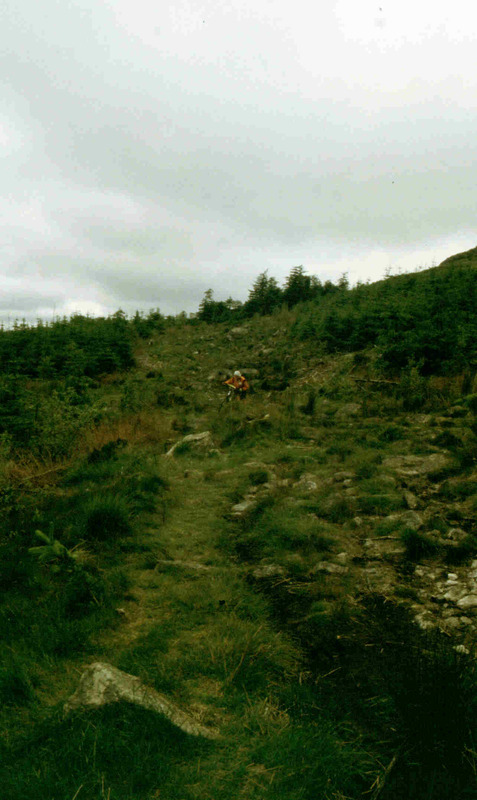 An easy track slanted upwards between Ulpha Fell and Harter Fell, the worst part being a boggy, rocky section just after the top where trees had been felled leaving plenty of scratchy brushwood. We had a superb ride down through the woods to join the tarmac a couple of miles before the Newfield Inn where a stop was made for soup and coffee. The weather was worsening so we decided to abort the bridle path across Waberthwaite Fell in favour of the track past the ruins of Frith Hall, once the hunting lodge of the Fleming family in the 1600s and later an inn on the pack horse route to Millom. This was a good ridable track which brought us out not far from the road over Corney Fell where we realised it had been a wise move not going over Waberthwaite Fell as we were now in thick cloud with visibility down to 25 yards. An unsurfaced road took us down to sea level at Bootle and the coastal road past the M.O.D. Firing range at Eskmeals to join a stretch of the Cumbria Coastal Path along the River Esk. Not to be recommended as it is tidal and very wet, the only redeeming feature was a close encounter with a buzzard dining on the remains of a deep sheep. It came on to rain for the ride back to the camp site and continued all Sunday so we went to Whitehaven to where the tall ships were in smartened up harbour. An excellent weekend but hardly the gentle exercise the doctor had advised for Simeons sciatica.